My Favorite Cute Outdoor Water Fountains for Sale! One of the best ways to decorate a nice garden and make it look amazing, especially at night, is to have a beautiful water fountain! 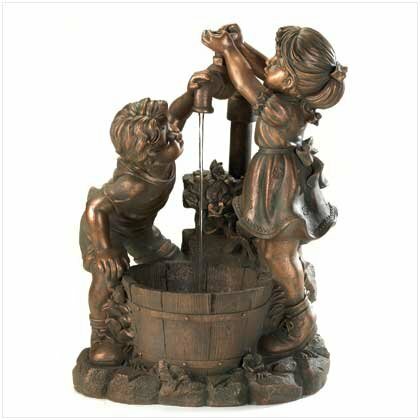 *I love cute and unique garden water fountains, just like this fun boy and girl water fountain on this picture! Isn’t it adorable? I love this antique painted bronze finish! The water will flow from the faucet held by the little girl and then flow into basin! Isn’t it perfect to have by your swimming pool or pond? Great gift idea for moms and grandmothers too! 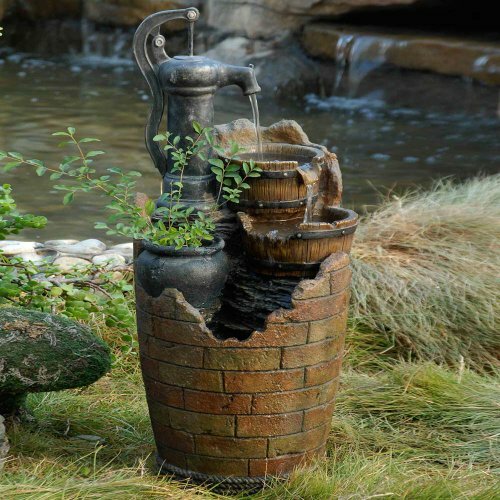 On this page you are going to find my top favorite cute garden water fountains for sale! There is nothing more soothing and relaxing than sitting next to a refreshing garden fountain and just listening to the water… It is very therapeutic! This is probably one of the cutest children water fountains around! 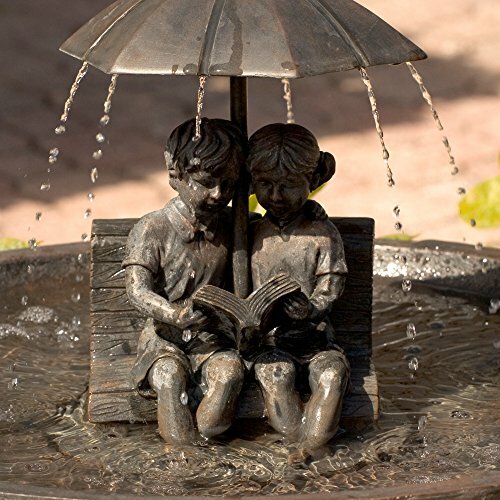 It is a boy and a girl reading on a bench under an umbrella solar outdoor fountain! It is fun, unique and it has a beautiful aged bronze finish too! Just keep it in a place where it takes direct sunlight every day and that’s it! Perfect fountain for the parents of a boy and a girl or grandparents too! The children also love watching the fountain suddenly start working when the sun hits on it! 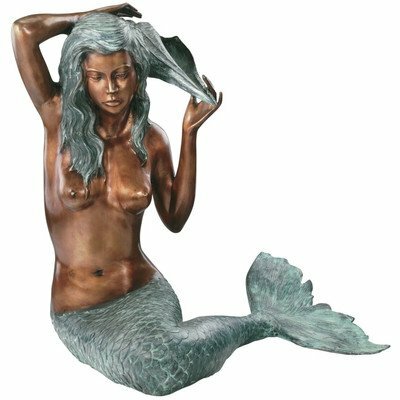 Then you are going to go crazy with this gorgeous mermaid garden water fountain! She is very tall and has this beautiful bronze finish! Beautiful piece to have in your cute garden! 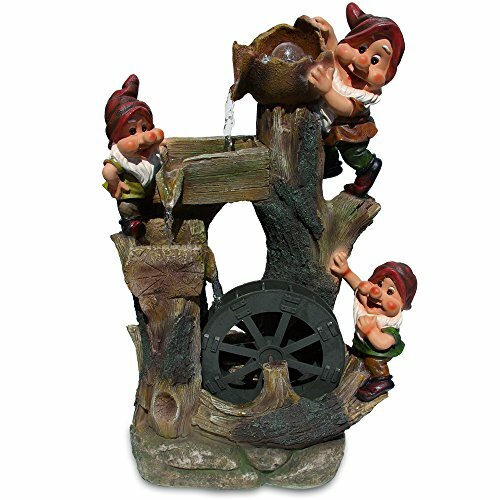 How fun and absolutely adorable is this gnomes water fountain for gardens? What a great piece to have anywhere outside! 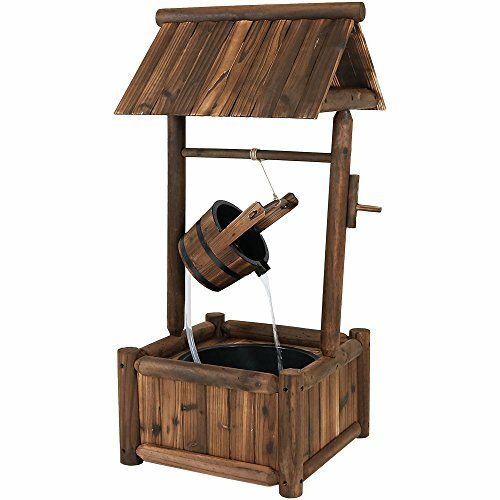 This is a beautiful and very nice old-fashioned style pump pouring water into barrels fountain for your garden or patio. Perfect to have among your plants! I love the natural metal and wood look! Are you also an angel lover? 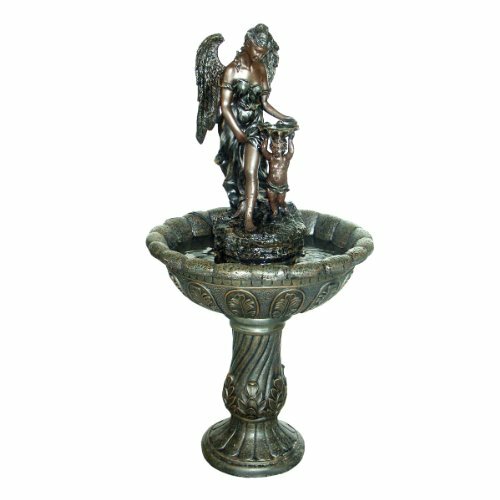 This is a beautiful and unique angel water fountain for sale! Is that a child inside? 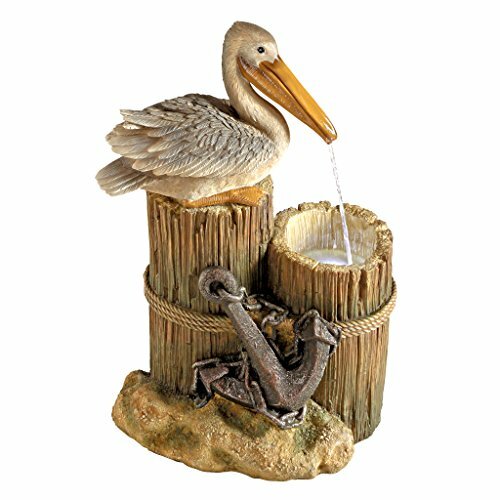 What a gorgeous pelican fountain with LED light for your garden! *Of all water fountains for gardens, the lighted fountains are everyone’s favorites! They look absolutely amazing at night! I also had to show you this gorgeous looking three bowl cascading water fountain for sale! I love this cool bowls and pillar ‘stone’ design! Very relaxing to look at! It makes me think (and smell) of rain! Great to relax and meditate listening to the sound of the water cascading! This is one of my favorite water fountains for gardens! 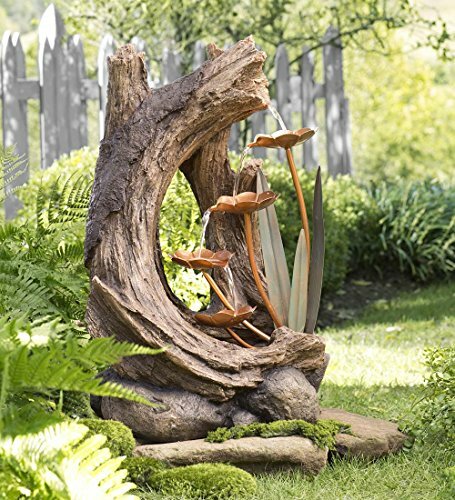 It’s a large tree stump design water fountain with cute metal ‘bowl-shaped’ flowers! The water will cascade all the way down from the tree stump into the metal flowers. Just perfect to place it among your plants on the lawn. How would you like to have your very own ‘wishing well’? You can make wishes every single day! 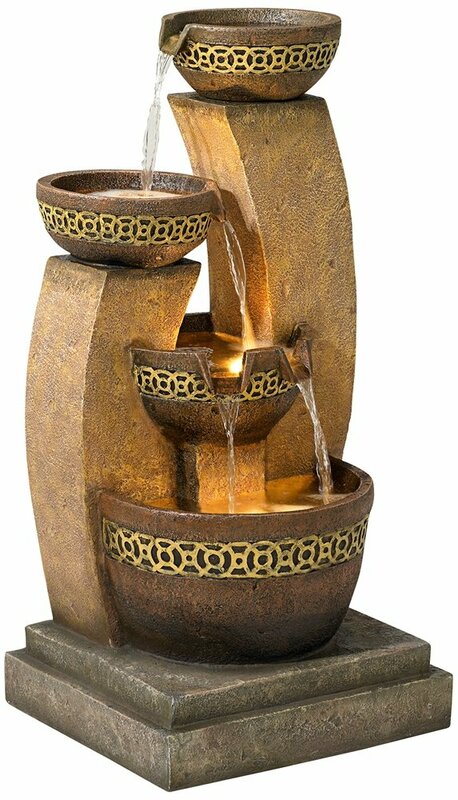 This is a gorgeous ‘rustic’ style wishing well tall outdoor fountain! It is 46 inches tall. It comes with the electric pump and all you have to do is plug it in and start making wishes! *Did you enjoy these cute outdoor water fountains? How about also getting one for inside? Amazing ZEN Indoor Waterfalls for Sale!